Our son loves taking guitar lessons from Mike! Mike is positive, yet honest to help our son progress. Can’t wait for Ace to play in a recital! – Beth N, Liberty Hill, Texas. I really enjoyed my piano lessons with Mike at HitMaker Music School! It had been nearly 30 years since I played piano on a regular basis and I wanted to refresh my skills but also understand music better. Mike spent time helping me understand how songs are put together which I found fascinating! I now understand how musicians can sit down and jam with each other and songs come together! I also felt that the cost for the lessons was very reasonable. Mike was also very accommodating with scheduling the lessons. – Leigh McRae, Cedar Park, Texas. Two of my children did voice and piano lessons for several months with Mike. Each lesson was tailored to their skillset. They were pushed at a reasonable rate, progressed well and gained a lot of experience during their lessons. We especially loved the collaborative concerts they host. Hit Maker has a small town feel and teachers who care about the kids. – Lyndsay Tuckner, Liberty Hill, Texas. My daughter is really happy here, and so am I. The recitals are really important for confidence, and they’re fun as well. The teachers are professional, compassionate, and flexible. I’ve recommended the school before, and I will continue to recommend it. – Cris Kosnik, Cedar Park, Texas. I loved the service and have told several of my friends about HitMaker Music School. The kids are offered opportunities to perform in recitals, which I think is priceless! – Deborah Gold, Leander, Texas. We initially contacted Mike w/ HitMaker Music School when my daughter was looking to audition for a summer play. Mike began working with my daughter immediately helping her discover her voice range and key songs for her audition. After two months of lessons, my daughter ended up loving the lessons so much she decided not to audition for the play after all and continue to take voice lessons throughout the summer and sing in one of the summer concert serious the school put on. It was the most AMAZING thing to see my daughter blossom on stage and sing the PERFECT song for her! This experience boosted her confidence and was a magical moment for our friends and family who came to watch her musical debut. If you are interested in voice or music lessons of any kind call Mike! You’ll be happy you did! – Lichman Group, Leander, Texas. Mike is a great vocal coach. He is encouraging and firm. He wants you to succeed as a musician. Highly recommended! – Bob Householder, Leander, Texas. Mike Irene is the real deal. Excellent teacher, musician and performer, with the credentials to back it up. This is what Mike loves, and it’s reflected in his students. He really instills a sense of creativity, exploration and joy into his students when it comes to music. He has frequent recitals, so students have a chance to showcase their talents and progress to family and friends. Most students are 18 and under, but very highly recommended to all ages and skill levels. – Ben Gray, Cedar Park, Texas. Excellent instructors, and our son loves going to lessons with Zach. They do a great job of instructing and holding the students responsible for practicing. – Tj Wagner, Cedar Park, Texas. Highly recommend HitMaker Music School! My 8 year old is thoroughly enjoying his guitar lessons and making strides in his learning. Knowledgeable and exceptional client support to boot! – Kenna Stone, Cedar Park, Texas. I have been taking drum lessons here for about a month now with Mike Irene. He teaches students of all ages. He is a fantastic teacher! I have a lot of fun while I am there. Mike is very patient and very encouraging even though I am definitely one of his slower students. I have noticed big improvements in my rhythm and hand strength since starting lessons with Mikey. The studio is nice and always clean. Mike is a very nice and just overall great guy. He has been great at keeping me engaged and getting better! I would give this place ten stars if I could. Thank you Mikey! – Michael Simmons, Cedar Park, Texas. Hit Maker has given me experiences and opportunities I am so thankful to have!! Not only has this music school strengthened my passion for music, it has given me amazing friendships with amazing people. If ANYONE wants to pursue music, Hit Maker Music School is the place to go!! – Anna McCauley, Cedar Park, Texas. I am very pleased with the teachers! I appreciate them working with my girls to ensure they are providing the best learning experience for THEM! We have been with the school almost a year and looking forward to expanding our musical learning to include drums and guitar, in addition to the piano. – Liz P., Cedar Park, TX. One of our Adult students playing on our backyard stage. We initially contacted HitMaker Music School when my daughter was looking to audition for a summer play. Mike began working with my daughter immediately helping her discover her voice range and key songs for her audition. After two months of lessons, my daughter ended up loving the lessons so much she decided not to audition for the play after all and continue to take voice lessons throughout the summer and sing in one of the summer concert serious the school put on. It was the most AMAZING thing to see my daughter blossom on stage and sing the PERFECT song for her! This experience boosted her confidence and was a magical moment for our friends and family who came to watch her musical debut. If you are interested in voice or music lessons of any kind call Hitmaker! You’ll be happy you did! – Kari, Cedar Park, TX. 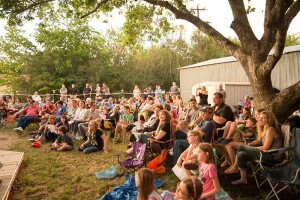 Our backyard Concerts are a BLAST !!! 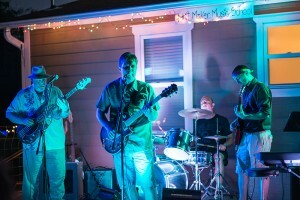 HitMaker Music School Leander for music lessons in Leander, Cedar Park, Georgetown and Liberty Hill.